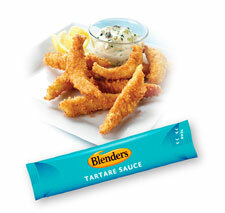 A luxurious tartare sauce with a subtle hint of lemon and bursting with the flavours of thick and chunky real capers and gherkins. Perfect with all fish. Available in 200 x 14.7g pack sizes. Store at ambient or chilled temperature. For best results keep cool. Do not freeze.